............ watch the video if you want to find out. Huge Congratulations to all the winners and thank you so much for your support ladies. 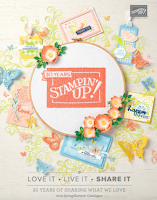 Of course I wish you could have all won a prize but don't worry each order will have a little prize from myself, although you are all winners as you all get a FREE STAMP SET. Enjoy your goodies. Now you probably stopped to visit me and noticed that my blog is changing, I fancy a change and I want to apologise for the mess that it is in at the moment, it will be perfect soon with a lot of help from my lovely downline Jo. I have some really exciting things coming soon so please bear with me. Now let's talk SNOW!!! Oh my, is getting serious I mean is 6" already ( it never stopped all day) plus is supposed to carry on snowing all through the night. Going to work today was not fun is really terrible through our estate, so I am not looking forward to snow tomorrow. I did grab tons of old bed sheets tonight and covered my car so at least I won't have to spend 20 min in freezing cold clearing and scrapping snow of it. Ok for something crafty I had a spare 10 minutes today and I wanted to see if I could get a card done, well I did but you can tell I only spent 10 min. Pretty card, but if you look closer you will spot a few mistakes. I really ended up rushing about, because lets face it you know you can't really make many cards in 10 minutes unless they are like simple and I mean really simple. My theory was if I am going to make this work I needed BIG stamps and that s how I ended up with the A Rose is a Rose. 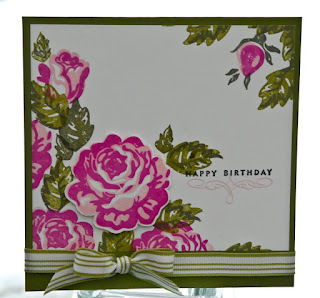 Old Olive card base, ink and striped ribbon, Pretty in pink and Pink Passion. Is a nice card well apart from the sentiment being placed into the leaf, but I could build on it. It was just for a bit of fun. Yes, your card is beautiful. If you think you have lots of snow...here in southwestern Ontario, Canada we received about 4 feet of snow last weekend. Great card! 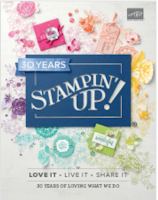 Geez it takes me 10 minutes just to pick out the stamp set, another 15 for the colors, etc . . . Impressive! Those are not mistakes they are proof that your card was handmade!